I have this obsession with almond butter. It’s heart healthy and delicious, plus it comes in cute little glass jars. I’ve been saving the jars knowing I could use it for something … I’m just not sure what. 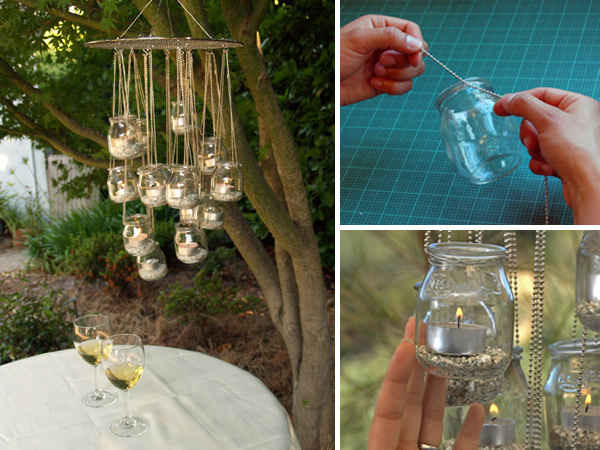 So I’ve been researching projects I like involving glass jars – it’s recycling and crafting in one. Start by mounting a sheet of stainless steel to the wall, then gluing neodymium magnets to the tops of one piece canning lids , filling the jars with your favorite spices and voilà! 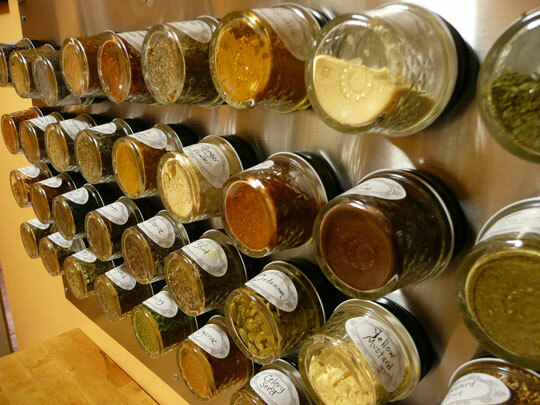 A space saving magnetic spice rack! For more on green crafting go to Crafting a Green World. Can you cook? The sky’s the limit. Preserves, jelly, chutney, and salsa — almost any treat can go into a jar. 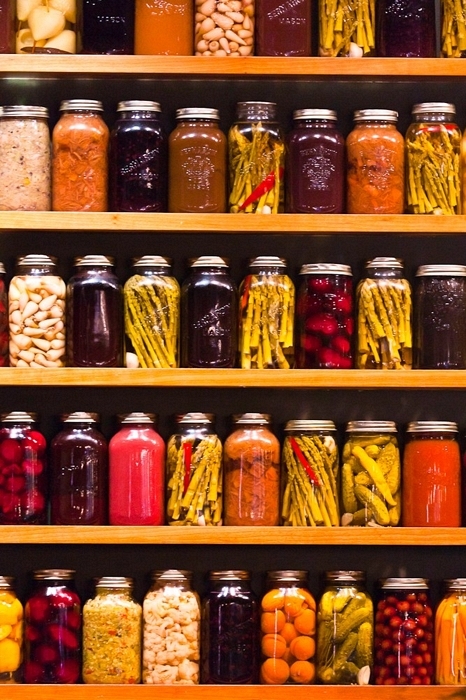 (Remember to use strict food-safety practices with home preserves; you don’t want to give your loved ones botulism for the holidays. A decorated jar can be a lovely way to present dry foods as well, such as peanut brittle, toffee, drop cookies or roasted or candied nuts. Pair it with Christmas ornaments or candles for a festive, colorful gift bundle. Chances are, once you’ve started thinking about ways to reuse glass jars, you’ll never throw one out again. Have fun, and don’t forget to share the results. For more on this, go to TLC Family. For more on this, go to Good Housekeeping. 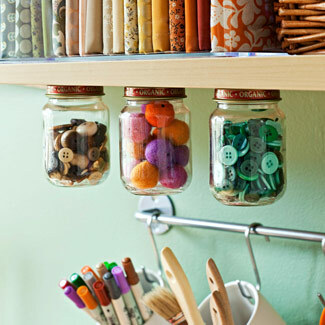 Another great idea is to make your normal glass jars into fancy hanging glass jars. Simply add something inside the jar then place a tea candle inside. Use wire to hang it up and you have a unique chandelier. For more ideas on this, go to Paige’s Sentimental Gifts. It looks so wonderful! This Glass jar spice rack was featured on Cute Mason Jar Craft Ideas. My name is Meg and I am contacting you to obtain a permission to feature your work using Mason Jars on one of our publications in Japanese language. Basically I would like to ask if it is possible to use photos of your Mason Jar works from your blog on our new handy guide on Mason Jars, which is currently being written. Your name, the state/country of residence, and your homepage/blog address if requested will be printed on those pages. For further details please contact me personally. Since there is only a limited time until the publication, I would very much appreciate your earliest response regarding this matter within a day or two. Thank you very much for your time on this. Hello Meg, you are welcome to use whatever you would like from the blog. Hi Angel, thanks for your permission. Just as a token of our gratitude we would like to send you a copy of the book once its published. If you would like it, could you personally e-mail me (I think you can see my contact address??). New Ideas | 40+ Uses for Mason Jars! The world of Mason Jars | Just For Sybarites!